﻿The 2015 Farm 2 Fork Festival was the biggest to date. Thanks to our amazing local farmers and the many visitors to Riverside Park, we were able to serve more food than ever before. The weather was perfect, and our new partnership with HoboFest helped promote tourism and business in downtown Saranac Lake. At the core of Farm 2 Fork Festival is our hard-working, dedicated Organizing Committee, but there are so many people, businesses and organizations that help make this event possible. 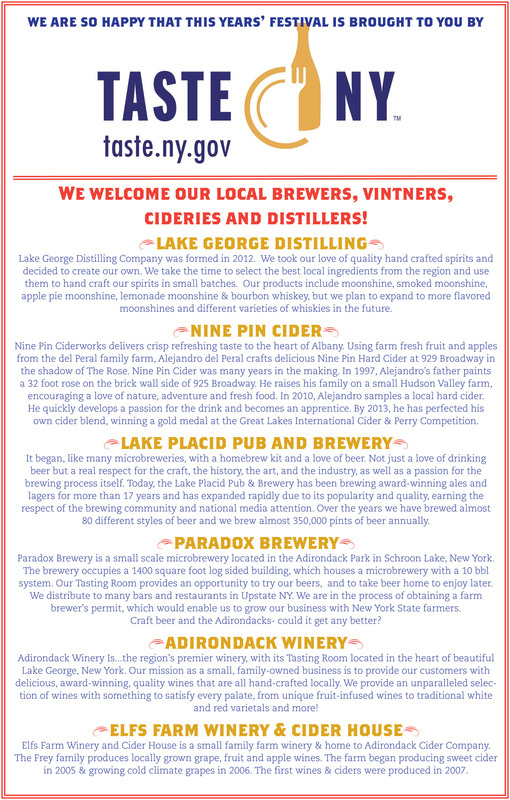 Thank you to our partnering sponsor, Taste NY, and their vendors: Elf’s Farm Winery & Cider, Nine Pin Ciderworks, Gristmill Distillers, Forever Wild Beverage Co., Hid-In-Pines Vineyard, and Adk Bloody Mary Tonic. Our media sponsor, North Country Public Radio. Our sponsors: Casella Waste Management, Paul Smith’s College, and Prime Lending. Our home cooks and their helpers: Fred Bomyea and Glenn “JJ” Pareira, Jess Ackerson and Phil Newton, Kate Glenn, Natasha Bristol, Sarah Curtis and Kelly Hofschneider, Chris Morris and Sarah Reynolds, Adrien Vlach, Judy Nisson and Jill McKenty, Erin Vennie-Vollrath, and Brandon Devito. Thanks also to: Catherine Bemis and St. Agnes School, Joseph Orefice and North Branch Farm, Fledging Crow Vegetables, Juniper Hill Farm, Rulfs Orchard, Rhonda Butler and David Brunner of Asgaard Farm, Jecinda Hughes and Josh Wilson of Origin Coffee Co., Nori’s Village Market, Ken Fontana and Blue Moon Café, Adam Harris and Grizzle T’s, Craig Bailey and Shamim Allen of the Fiddlehead Bistro, Thomas Murphy and the Downhill Grill, The Pinecone, Saranac Lake Volunteer Fire Department, Village of Saranac Lake, Mayor Clyde Rabideau, Saranac Lake Central School District, Jacob Stanbro and Nonna Fina, Johnny Muldowney and the Saranac Lake Area Chamber of Commerce, Nancy Moriarty and Lake Flour Bakery, Peter Seward and the HoboFest team, Nick Bristol and Jesse Purcell, Linnae Hamilton, Leslie Karasin, Angela Petito, Katherine Levin-Lau, Judi McIntosh, Bob Burns, Lynne Burns, Marcy Gotzmer, Brad Izdak, Courtney Grimes-Sutton, Mikey Portal, Kathy Ford, Michelle Charleson, Katie Culpepper, Lindy Ellis and Rich Shapiro, and Kristen Levielle. And our musicians: Matt Heckler and ADK Hot Club—Alex Marklund, Bobby Davis, and Stephanie Sears. A special thank you to Taylor Rental for supplying us with a tent, tables, chairs, coolers, and more—this business does so much for our community. And thank you to the community of Saranac Lake—we are so blessed to live, work and play here. The Organizing Committee hopes to grow in 2016 and is looking for a few new members. If you are interested in getting involved, please contact Gail Brill at gailbrilldesign@gmail.com or Chris Morris at chrjmorris@gmail.com. Gail is our fearless leader, and she also sounds great on public radio. Click here for Todd Moe's interview with Gail about this year's Festival. ... so our incomparable Event Coordinator Gail Brill created this map! 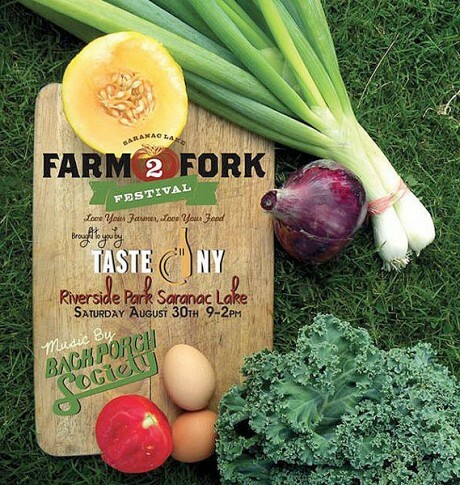 SARANAC LAKE – A bounty of locally produced food and drink is on the menu for the fifth annual Farm 2 Fork Festival, scheduled for 9 a.m. to 2 p.m. Saturday, Aug. 30 at Saranac Lake’s Riverside Park. New this year, local organizers have partnered with Taste NY, a program of the New York State Department of Agriculture and Markets, to highlight the quality, diversity and economic impact of food and beverages produced in the Adirondack region. A collaboration of the Adirondack Green Circle and the AuSable Valley Grange, the festival’s mission is to expand the support of local foods and local farms and promote food awareness in the northern Adirondacks. 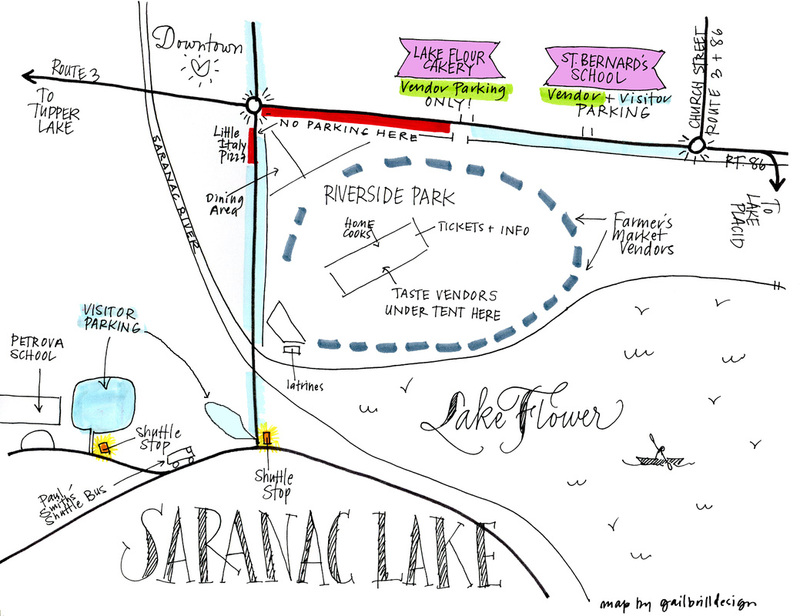 The festival runs in conjunction with the popular Saranac Lake Village Farmers’ Market. The event begins with remarks by Brill and Franklin County Legislator Barb Rice, who also serves on the village of Saranac Lake’s Board of Trustees. The morning proceeds with a series of presentations, including Tammy Morgan on Lake Placid’s biodigester project and Drew Matott on using spent beer grains to make paper. Additional speakers will be added as the festival draws closer. Following the presentations, visitors will be invited to take the stage and participate in a “recipe slam.” If you have a favorite recipe prepared from local ingredients, this is your opportunity to share it with the world. Information on how to sign up will be available at Riverside Park on the day of the festival. The festival’s marquee attraction will once again be a colorful, diverse lunch featuring food prepared by eight home cooks. Tasting tickets cost $10 and include hand-cranked ice cream, pickle bar, and sips from the artisan beverage bar. Also new this year is a food art competition. Participants are encouraged to bring carved vegetables or fruit, which will be judged by a group of local farmers. Winners will be announced at 2 p.m. and have a chance to win a Farm 2 Fork cookbook and a $25 gift certificate redeemable at the Farmers’ Market. Live music by the Back Porch Society will run from noon to 2 p.m. This year’s festival is sponsored by Taste NY, Casella Waste Management, Paul Smith’s College, Golden Arrow Lakeside Resort, Franny Preston of Prime Lending, and Mike Foote of State Farm Insurance. The festival also receives support from private donors through Adirondack Foundation’s crowdfunding website, Adirondack Gives. Special thanks to the North Country Healthy Heart Network for serving as fiscal sponsor to facilitate philanthropic gifts. For more information about the Farm 2 Fork Festival, please contact Gail Brill at (518) 586-1063 or gailbrilldesign@gmail.com. For festival updates, find us on Facebook by searching for "Farm 2 Fork Festival in Saranac Lake."